Heather Ihn Martin is an amazing fine artist that I personally have been following since I joined the Instagram world. Her vibrant colors, soulful paint strokes and occasional feathered friends bring such light & joy to my feed! I reached out to her in hopes of getting a behind the scenes look into how she creates such inspiring art, and to see if she had any advice for people looking to find success through their own passion. My personal favorite thing about Heather’s artwork is her amazing ability to bring beauty to what would typically be considered mundane. Her unique artistic style transforms scenes of everyday life into refreshing magical art pieces. 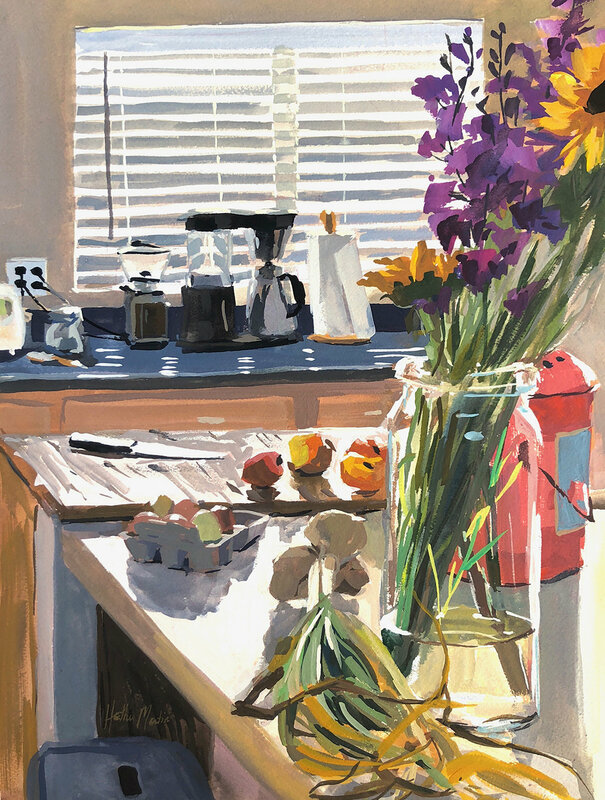 She manages to capture & highlight the beauty of common-place subjects, including: an empty dinner plate, a PB&J sandwich, a mason jar, a can of beans, a bear shaped bottle of honey, and more. To me, her work seems to bathe these everyday objects in a whole new light, inspiring viewers, like me, to reframe how we view our daily environment to see & appreciate the beauty and life of every moment. It was amazing getting to know more about how she cultivates and translates this unique point of view. Enjoy!! What is your artistic passion? How did you first discover your love for it? I've always been passionate about art, and have been drawing since I could hold a pencil. However, my love for painting from life didn't really spark until the past 2-3 years. Balancing a full time job and long commute, I coped by spending my lunch hour painting in the park with friends to relax. It was so fun, and I started seeing beauty in everything around me. Soon I was painting during every spare moment. How do you know when a piece is 'done'? It's always hard to know when to stop. There have certainly been times when I should have stopped but continued, and sucked the life out of it. However, this can be avoided by setting some sort of time limit. By doing plein air paintings, there is only so much time that you have before the light completely changes, so that helps. Also, constantly checking your work in either a photo or a mirror, or turning it upside down helps bring to light any issues that might need to be fixed before calling it done. Being a full time fine artist would be a dream. Technically it's what I'm doing now, but it would be great to be financially secure and able to focus more on just purely painting. I would love it if people gained appreciation for beauty in spots that aren't typically admired. It would be great to have people notice and appreciate the way the light is hitting on the coffee maker in a kitchen, or the way a tree trunk bark peels away to different colors. My work spaces are slowly taking over the house. There's computer office where I can do digital illustration and update things on the marketing end. The other area is strictly traditional, and it's actually part of the living room. Having it in the main area is great because I can hang out with my husband and the animals while they're relaxing on the couch, and still be productive and get a painting in. As far as aesthetics, it's nothing fancy. I've always been very straight forward with my spaces. Decorating would be nice, but it's a low priority, and I'd rather spend the time making art. I would say that "time" was initially the biggest struggle, because it was very limited in the beginning. It was difficult to break through, but organizing my time down to the minute helped. Eventually, once I felt confident, I left my full time job and now the struggle seems to be money! It's a tough balance, but the difficulties in it make you problem solve and force you to get a little creative. Just do it! Quit thinking about it, and take action. If you're looking to do it for a living, make sure you REALLY love it and want it to take over your life night and day. Also, know that a lot of it is business and marketing, so it's not as dreamy as you may think. But if you are just looking to dive deeper, then jump in head first. An important piece of advice is to not get comfortable, and always challenge yourself. And don't forget to HAVE FUN. Follow Heather on Instagram: @heatherihnart or visit her website heatherihnart.com to see more of her fabulous work!! What's the best place for people to find you online?